Today's card was inspired by the card on the new Muse challenge blog. The stripes and the flower were my inspiration for this card for my children's Grandpa. We will miss you a lot Grandpa, may you rest in peace and be free of pain. It has been a tough go this last week, but the release of creating for their Grandma was very soothing. Of course, my daughter and I always think things look a little better with just a little bit of sparkle. It is hard to tell in the photos, but the main focal image was lightly coloured with silver and stardust sakura pens to give some soft glimmer to the focal image. The stamps are Gina K as is the white cardstock. The black cardstock is CTMH as is the button. Ribbon and thread are from my scraps drawer. I used a swiss dots cuttlebug folder and a spellbinder die (label #16 I think). I would also like to enter this in the Make It Monday challenge where it is always anything goes. Hi Katherine, this is so elegant and I just love the sparkle on the button. Love how you have decorated the inside-hope that making this made you all feel a bit better. So sorry about you having to create a sympathy card. The classic black and white is pretty. So sorry to hear about your loss. It is always hard to let loved ones go. Great job with the Muse challenge. 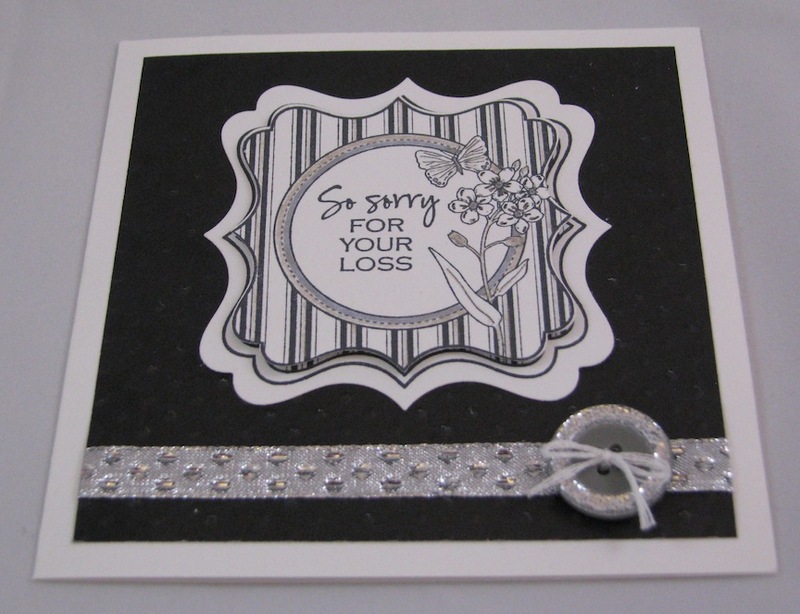 You've created an elegant sympathy card and hoped it helped with your loss. Thanks for linking it up with MIM this week too. So sorry about your loss. The frame shape is very elegant and perfect for a sympathy card. So glad you joined the Muse Card Club!! I am so sorry to hear of your Grandpa's passing and what a beautiful card today in his honor. Blessings to you and your family. I saw it on MIM. My sympathies to you and your family. These are not fun cards to make, but when you make them with love knowing that the receiver is going to smile, it makes it all worth while. This is a lovely, elegant sympathy card. I'm so sorry you had to make it! A wonderful CASE of Amy's MUSE card! spotted your very elegant card on MIM and came for a closer look.Hugs Mrs A. So lovely and soothing, Katherine! The stripes and little bit of sparkle on the outside and die cuts on the inside really make this special. So sorry for your loss.